Fail a build or release based on various conditions. Simplest use case for the Fail task is demo and testing purposes. It is a simple straight forward way to show what it look like when a build fails and how this information is communicated (alerts, dashboard etc) without intentionally checking in bad code or misconfigure an existing build/release template. 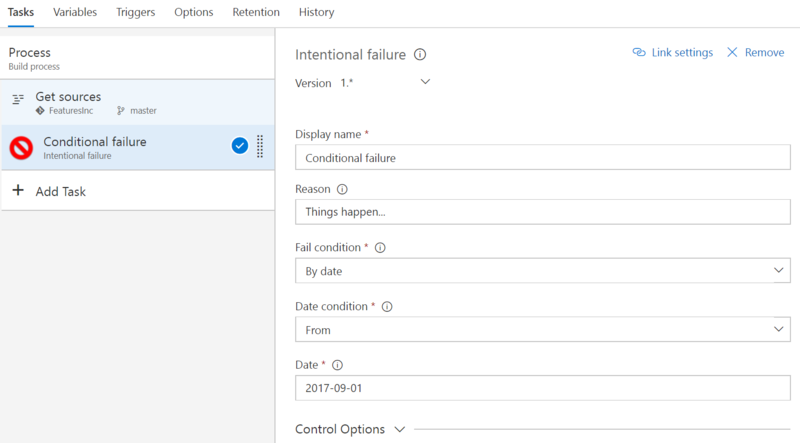 The Fail task can also be used to ensure a build/release is not (successfully) run before or after a certain date (typically planning, legal or licensing reasons) or to fail a build/release based on output variables from multiple previous tasks even though each of those individual tasks passed. Add a new task and select Fail from the Utility catagory and configure as needed. Fail condition: Select condition for failure. "Always", "By date" or "By expression". Date condition: Fail before or from the specified date. Expression: Powershell command which evaluates to true or false. Default mode for the task is to fail. If the specified date or expression cannot be resolved the task will always fail. Date must be in yyyy-MM-dd format. Expression must be a valid expression for the PowerShell Invoke-Expression cmdlet. An error or warning will be logged depending on if failure condition is triggered or not.